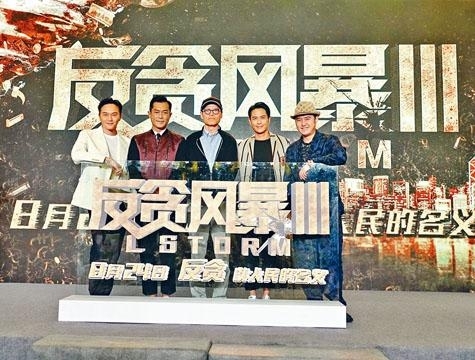 The anti corruption action film THE L STORM (L FUNG BO) has been scheduled for an August 23rd release in Hong Kong. Yesterday the film held a Shanghai press conference. 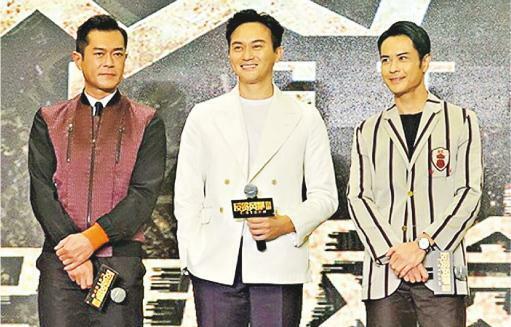 Director David Lam Tak Luk along with actors Louis Koo Tin Lok, Julian Cheung Chi Lam, Kevin Cheng Ka Wing and Feng Lei attended. Director Lam Tak Lun revealed that this time the film not only continued the spirit of its predecessors but with major upgrades. The case scale, anti corruption team, action scenes would break through the past. The film would have bright spots galore, including sea, land and air pursuits, major explosion and action scenes. Goo Jai, Chilam, Ka Wing and Feng Lei displayed their "eye abilities" and interpreted various highly different looks. Goo Jai and Chilam had to stare at each other viciously and hopefully, which were rather awkward for them but great for the audience! Chilam even revealed Goo Jai's secret of staying young, when on the set he would not eat from morning to afternoon. He would not eat until night. Goo Jai stated that he has kept this habit for years. He would finish work at night, eat then sleep. The press conference even directly turned into an "anti corruption event". The organizers "in the name of the people" presented anti corruption awards to the actors. Goo Jai was praised as "anti corruption role model", from the first to third film Goo Jai's Luk Chi Lim has been dutiful and faithful to his anti corruption profession. This time in the anti corruption process, Goo Jai even personally performed various dangerous stunts; Chilam was called "anti corruption disguise master. In the film he turned Filipino for an investigation and even spoke Tagalog; Ka Wing as the L team investigation supervisor relentlessly went after Goo Jai. He not only targeted Goo Jai but also performed an exciting "boat scene". Thus he was dubbed the "anti corruption gatekeeper". Due to how close "boat" and "bed" sound in Putonghua, Ka Wing while talking about the fight scene with Goo Jai on the boat said "bed" scene and the audience could not stop laughing.